This is part 2 in a series of 3 posts on ALGO 2009, largely repeating the organiser’s report from the business meeting. For some conference attendees, this has already become a drinking game: the part where the organiser entertains with useless statistics. More interestingly, in particular to later organisers of ALGO: the budget. When planning an event like this, the big open question is how many people will actually show up. Previous ALGO organisers were very helpful in giving us their numbers, but it’s hard to use them for prediction. Previous ALGOs hosted ESA, WAOA, and ATMOS, but in 2006 and 2008, ALGO also hosted WABI, the Workshop on Algorithms in Biology, which is a large conference. We did attract IWPEC to ALGO 2009 (two dozen talks), but it is unclear how many extra attendees this produces – ESA itself had several tracks of IWPECish presentations, so there is a lot of speaker overlap. 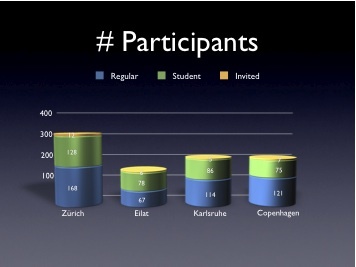 In the end, we were able to match the Karlsruhe numbers, even without WABI, and without the large number of local attendees Karlsruhe presumably had. 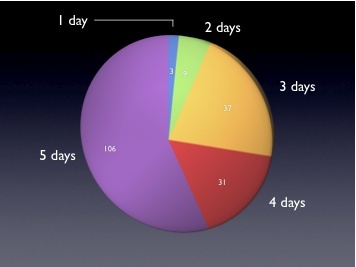 Another constant throughout the ALGO budgets from previous years is the assumption that an attendee stays for 3 days. (You need this to calculate the number of lunches.) We asked attendees at on-line registration to tell us their expected date of arrival and departure, and asked them to confirm these dates when they collected their name tags. If these numbers are to be trusted, more than half of the participants actually stayed for the full week; in particular, they gluttonously devoured all the food they actually paid for. This would be a huge success from the perspective of us wanting to organise a large, monolithic 5-day event. Of course, since we have to order all these lunches, there is very little wiggle room left in the budget. The only expense that could have been reduced is the invited speakers. First, ALGO had a lot. 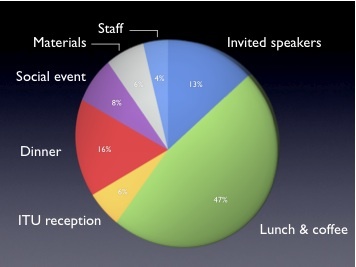 7 invited speakers for an event with less than 200 registrants cost a lot of money per ticket. In even years, ESA “pays” for 2 invited speakers on the first three days, WABI gets the third. We decided to have 3 speakers on the first three days anyway, and 2 speakers per day for Tuesday and Friday, which hopefully transformed these days into very attractive experiences and made many people stay beyond ESA. Of course, all of this is expensive. Should I do this again, I would probably be less generous. A possible model would be to let invited speakers pay for their own travel. (This is something that the speaker can easily find funding for anyway.) I understand that other conferences use that model, or at least put a cap on the travel reimbursement. 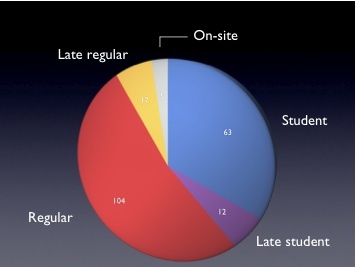 This entry was posted in Conferences on September 21, 2009 by thorehusfeldt.